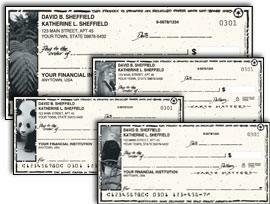 Buy Checks Made From Recycled Paper & Printed With Soy-Based Ink. Do One Thing: Buy Checks Made From Recycled Paper & Printed With Soy-Based Ink. This weeks Do One Thing is about the checks that you write. If you are anything like me, you don’t write many checks at all – I think I write about 2 or 3 a month at most with everything else being paid automatically online (the greenest way to go). But because we ran out of our last batch of checks left over from California, we needed to order new ones with our New Mexico address, and I refused to pay the fortune that the bank wanted to charge me for new checks. In looking at online options for check ordering, a Twitter friend recommended The Check Gallery, which proclaims to be “America’s leading earth-friendly check printer”. What a great find! They print their checks on recycled paper using vegetable-based ink, and they cost the same as most other check printers I have ever used. We ended up ordering two boxes (buy one get one for $.10 for new customers) of the Earth Matters checks above and we are very happy with them. So the next time you need to order checks, consider ordering ones made from recycled paper and printed with soy-based inks – the environment will thank you! What a great “one thing!” I hardly ever use the checks I have, but I know someday I’ll get a new account and have to replace them. It is amazing what such a small difference can make. We are using way too many cheques right now with the business – thank you for the reminder! hi. i know this’ an old thread, but in case it still gets traffic, wanted to add that message products checks (messageproducts.com) are as eco-friendly plus a portion of the purchase makes a donation to eco/animal organizations. I’ve bought my checks from Check Gallery for years. In fact the Earth Matters design shown here is the one I buy. First time buyers can use a code for a second cheap box (currently it’s GWND01). Also one might get free shipping with GWF525, although I haven’t tested that. I also found on Google “Checks In The Mail” that prints on recycled paper. Some of the checks on sites recommended are only 30% recycled material — yes, the printing on the checks advocate good causes, but why can’t the paper be 100% recycled? And it needs to be clearer on the check sales sites which checks are actually made of recycled paper and which are not.